I diecut my Happy Harvest dies from some Simple Stories patterned paper and cardstock. On the cardstock diecut, I stamped the sentiment in versamark and heat embossed it in white. I layered them over another strip of patterned paper. A very smart, modern fall design, Leigh! I may have to purchase my first Reverse Confetti stamps/dies! Leigh..love your acorn dies (Kim had a good set as well). 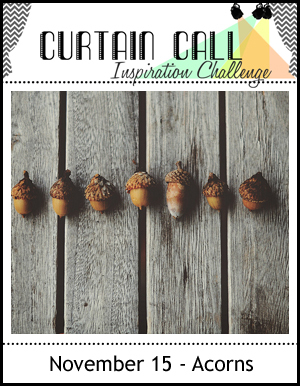 This trio of acorns is just wonderful! Thank you so much for inviting me to be a GD this week! Such a cute little trio of acorns. I love the buttons and twine! Adorable take on the challenge!